When I got back from Vancouver last week, all the local shops and ads had witch cartoons and drawings. I thought someone had missed the memo on Halloween until I started asking around. It turns out it had nothing to do with Halloween but January 6th. January 6th is a big holiday in these parts. We know it as epiphany but it's not a big deal in North America: it is in Europe. In Germany, kids come around, recite bible passages and mark the quotes they've read from the bible in chalk on doorways. In these parts, epiphany inexplicably involves a witch. 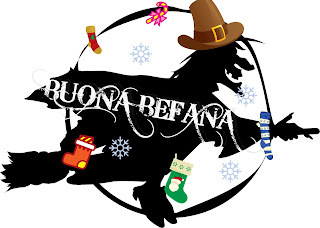 Befana as she's known, usually swings by on epiphany eve. From what I can figure out, Befana is a witch (or old lady with a broom, big nose, hat and a bag of candy) and much like Santa Claus in North America, she comes down the chimney. Like Santa, she brings treats. For the good kids, she leaves out candy, for the bad ones, she leaves out a lump of coal, or onions (?!?!) Where she's different than Santa is that she prefers wine to milk and cookies, so kids leave her a glass of wine. Also, since she travels with a broom, she's known to sweep up after herself before she leaves. When I found out that Como (a city about 30 minutes from where I live) had a famous Befana event, I had to find out what it was all about. A colleague told me that the Befana shows up in Como on January 6th. After googling it and looking up a YouTube video where the Befana swings down a zip line from the main cathedral, I decided I had to check this out. So today, I set out to find Befana. I headed to the main cathedral and tried to determine where she was going to zip line in from. Seeing no zip line, I was confused. Yet there were zillions of people so something was bound to happen. Maybe Befana was going wireless this year? I parked myself where the largest crowd seemed to be, by the fire truck and hoped for the best. I asked about of older ladies equipped with a camera where Befana was planning on flying in from. Apparently, that's part of the mystery, you never know. Right at 4, firemen got on the truck and worked the ladder. Befana was going to fly in on the fire truck ladder! Even though I hate massive crowds, hearing all the kids shout "Befana, Befana" was pretty damn cute. The Italian firemen picked up Befana from the rooftop next to the cathedral. It was a cool to see Befana swinging in, but I have to say, I've seen safer things than a witch dangling from a 100 foot ladder. At one point, it looked like Befana was going to crash into the cathedral and all the onlookers shouted at her "Befana, watch out for the cathedral", but maybe it was on purpose. At one point, she was dangling directly overhead and I have to say, it was a little worrying have a witch with a bag of candy dangling 100 feet over you. Halloween is not a big event in Europe and I don't know that it'll ever be. But then again, when you have witches in January bringing you candy and carinvale in February where you get to dress up, why do you need only 1 night a year?